Google news - Pirates commandeered a United States-flagged container ship with 20 American crew members off the coast of Somalia on Wednesday, the first time an American-crewed ship was seized by pirates in the area. The container ship, the Maersk Alabama, was carrying thousands of tons of relief aid to the Kenyan port of Mombasa, the company that owns the ship said. The ship was taken by pirates at about 7:30 a.m. local time, 280 miles southeast of the Somali city of Eyl, a known haven for pirates, a spokesman for the United States Navy said. It is owned and operated by Maersk Line Limited, a United States subsidiary of A.P. Moller - Maersk Group, the Danish shipping giant. The Maersk Alabama was at least the sixth commercial ship commandeered by pirates this week off the Horn of Africa, one of the most notoriously lawless zones on the high seas, where pirates have been operating with near impunity despite efforts by many nations, including the United States, to intimidate them with naval warship patrols. There was no additional information immediately available about the crew, the company said in a statement. The ultimate destination of the ship’s cargo was unclear. “Our initial concern is to ensure proper support of the crew and assistance to their families,” the Maersk statement said. 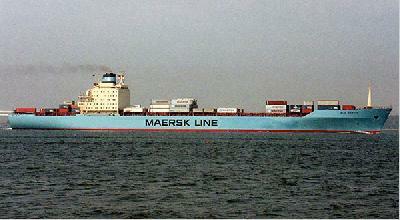 While Maersk Line Limited, based in Norfolk, Virginia, is one of the Department of Defense’s primary shipping contractors, it was not under contract with the Defense Department at the time of its hijacking, said Lt. Stephanie Murdock, a spokeswoman with the Navy’s Fifth Fleet, based in Bahrain. The 508-foot long ship was carrying food and other agricultural materials from Djibouti, according to a company representative in Denmark who did not give her name because she was not authorized to give information to the media. The ship can carry more than 1,100 20-foot containers and was deployed in Maersk Line’s East Africa service network, the company said. There have been more than 50 pirate attacks this year off of the Somali coast, with the bulk of the attacks occurring in the Gulf of Aden, which separates the Arabian peninsula from the Horn of Africa. Sixteen ships remain in pirate custody, most of them docked a few miles off the Somali coast, while ransom negotiations with the ship owners take place, said Lt. Nathan Christensen, a spokesman with the U.S. Navy’s Fifth Fleet. About 15 international naval vessels, including three U.S. Navy ships, now patrol the pirate-infested waters, many under an American-led task force created to combat piracy. At the time of the attack on the Maersk Alabama, the closest patrol vessel was some 300 nautical miles away, the Navy said. Most of the patrol vessels are concentrated in the Gulf of Aden, and as a result, the pirates have expanded their reach into the open seas. The Navy would not comment on whether its patrol boats were now following the hijacked vessel.